Below are five ways that the Trump budget undermines efforts to reduce gun violence and keep our nation’s students safe. Only three months ago, Americans were responding to another mass shooting—the massacre at the First Baptist Church in Sutherland Springs, Texas, that killed 26 parishioners and wounded 20 others. Because of his previous court martial for domestic abuse, the perpetrator of that attack should not have been able to buy the assault rifle he used to devastate a small community. However, the Air Force failed to provide a record of his conviction to the FBI for inclusion in the National Instant Criminal Background Check System (NICS)—the system used to conduct background checks for gun sales. Failure to provide records to NICS is not just a problem for military agencies; states have historically struggled to submit timely, accurate records of individuals who are prohibited from gun possession under federal law because of their criminal history. Two federal grant programs provide funding for states to help improve the submission of these records: the National Criminal Records History Improvement Program (NCHIP) and the NICS Act Record Improvement Program (NARIP). The Trump budget cuts both programs by a combined 16 percent, from $73 million in the fiscal year 2017 enacted budget to $61 million in the fiscal year 2019 proposal. It is telling that Betsy DeVos’ first response to the shooting in Florida was not to mobilize the U.S. Department of Education’s resources to support students, families, and educators affected by the violence, but to call on Congress to hold hearings. Indeed, Trump and DeVos’ budget completely abdicates responsibility for school safety, violence prevention, and recovery. The budget slashes $25 million—more than 36 percent—from the department’s funding for school safety national activities, including complete elimination of the Project School Emergency Response to Violence program, or Project SERV, ($2 million in 2017), and Project Prevent Grant Program ($14 million in 2017). 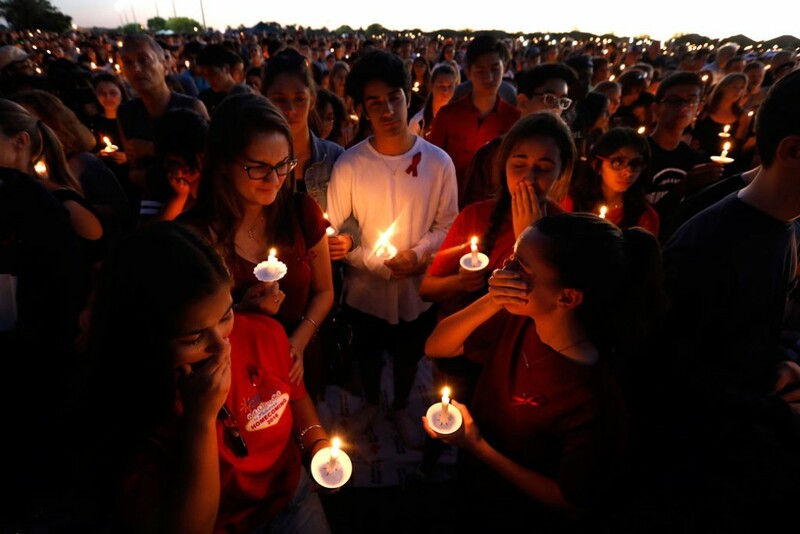 Following the similarly horrific shooting at Sandy Hook Elementary School in 2012, Project SERV provided more than $6.4 million over three years to Newtown, Connecticut, for immediate recovery, trauma counseling, therapy, and other programs. Incredibly, Trump and DeVos are calling to eliminate this funding that could specifically help the Parkland community heal from the tragedy. And Project Prevent is designed to provide students with counseling and social and emotional supports to help cope with trauma, anxiety, and the other effects of violence—as well as to prevent future violence and improve school safety. Under the Every Student Succeeds Act, signed into law in 2015, Congress consolidated a number of smaller programs that address student safety and health into the much larger Student Supports and Academic Enrichment Grants program. Districts must use at least 20 percent of their funding from this program for efforts such as violence prevention programs, mental health services, and training for crisis management and conflict resolution. In both fiscal year 2018 and fiscal year 2019, Trump and DeVos proposed eliminating this program entirely, cutting $400 million in funding for student supports. For the second year in a row, Trump and DeVos also proposed eliminating the $1.2 billion 21st Century Community Learning Centers Program, which provides before- and after-school and summer school programs for an estimated 1.7 million students nationwide. These programs can help extend the school day and provide much-needed support for working families to keep students safe outside of regular school hours. Additionally, among other possibilities, providers can use this funding specifically for violence prevention activities and programs for disconnected students who have been truant, suspended, or expelled. In 1996, a restrictive policy rider was attached to the budget of the Centers for Disease Control (CDC) that barred the agency from using any funding to “advocate or promote gun control.” This rider was accompanied by a $2.6 million funding cut—the exact amount of funding that had been spent the previous year to fund research into gun violence. The effect of this rider and budget cut has been a 20-year hiatus on government-funded research into the causes and consequences of gun violence, leaving policymakers at a tremendous disadvantage when it comes to developing smart, targeted policies to reduce gun deaths in this country. The Trump budget continues this restrictive rider, despite the fact that its original sponsor, former Rep. Jay Dickey (R-AR), expressed regret for how it has functioned as an effective ban on all public health research into gun violence and urged its repeal. Chelsea Parsons is the vice president of Gun Violence Prevention at the Center for American Progress. Scott Sargrad is the managing director of K-12 Education Policy at the Center.